The founders of the survivalist colony Safe Haven are sure that the end of civilization is at hand. Economic collapse, natural disaster, civil war — they're prepared for it all in their underground compound deep in the woods of America's northeast. But, in SHELTERED, the new series from Image Comics by Ed Brisson (COMEBACK) and Johnnie Christmas, the threat to their existence comes from a source they never expected: their own children. Coming in July, SHELTERED follows the consequences after Safe Haven's younger generation, raised in paranoia and isolation, rebel against their parents and take over the compound. Two leaders emerge from the rebellion: the teenagers Lucas, who led the revolt, and Victoria, who leads another group of kids in their escape. With Victoria set to expose Safe Haven, Lucas and his faction are determined to hunt her and her group down before they reach the nearest town, forty miles away through dangerous wilderness. 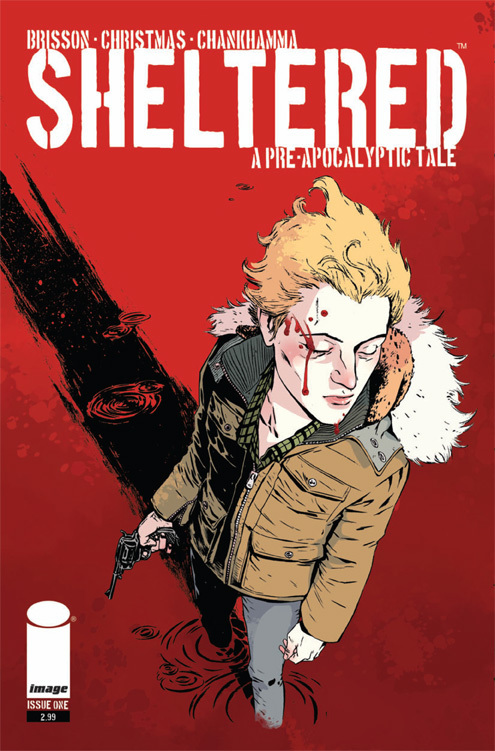 SHELTERED is a full-color comic book, with a five-issue first arc. Its first issue can be pre-ordered now (Diamond code MAY130408) and will be in stores on July 10, 2013. A four-page preview is up now at Multiversity Comics.